Roasted Bell Peppers in Sweet Onion Marinade - Let the Baking Begin! Bell Peppers in Sweet Onion Marinade – sweet peppers that are full of flavor borrowed from the marinade of vinegar, garlic and sweet onion. 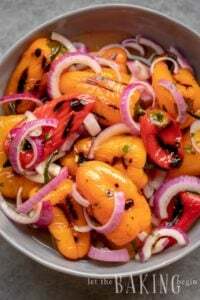 I posted a recipe for the mini bell peppers in the past, but now wanted to add a recipe for these meaty and delicious Bell Peppers in Sweet Onion Marinade as well. While the mini peppers win in presentation, I think regular sized peppers would have to win in taste. They have more flesh to them and when you bite into one, they have a different mouth feel then the baby ones. I served these Bell Peppers in Sweet Onion Marinade with baked yellow potato, drizzled with some salted butter and sprinkled with cheese. I have been trying to stay away from starchy foods and instead replace my diet with fresh veggies and some protein. This evening I really wanted a potato so, I skipped the meat and had myself a delicious potato and Bell Peppers in Sweet Onion Marinade dinner. 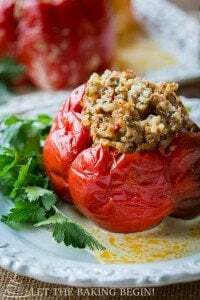 Stuffed Peppers Recipe – Peppers stuffed with beef rice filling. Pickled Mini Bell Peppers – Oven roasted or grilled then marinated in a sweet tangy marinade. 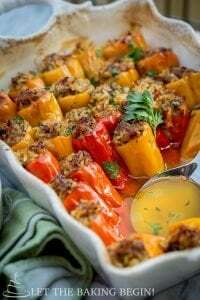 Sweet Pepper Appetizer – Crunchy peppers with a creamy egg filling. Roast washed bell peppers in the oven at 350F, rotating on each side until the skin puffs up and peppers brown up slightly. 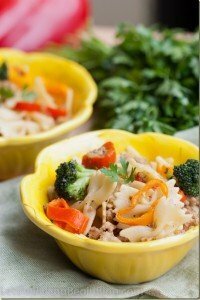 Remove into a dish and cover with lid or plastic wrap. Let sit for 10-15 minutes (to make the peeling easier). Peel and chop the onion. Rinse it under cold running water to remove any bitterness. Add salt, vinegar, garlic & oil, mix & set aside. Once the peppers are cool enough to handle, peel each pepper removing the skin, but leaving the stem(optional) (for presentation only). Line a dish with 1/2 the prepared onions, place the peeled peppers on top. Cover with the rest of the onions. Let sit for 1-2 hours, refrigerated. 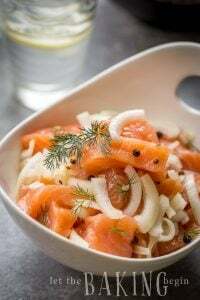 *The peppers can be eaten right away, but are better once they have marinated and absorbed some of the aromatic onion and the vinegar.